Hungary is a wonderful camping destination, with beautiful scenery, national parks and a fascinating culture. To find out more about luxury camping in Hungary, please feel free to contact the LUX-camp team. Why Should I Camp in Hungary? Hungary is a landlocked central European country that has borders with seven other countries. This makes it an ideal base to conduct a European tour, although there is plenty to see and do in Hungary itself. Hungary's capital is Budapest, and the official language is Hungarian. Hungary has a long and complex history and has seen successive invasions by Celts, Romans, Huns, Slavs, Magyars and Turks. Hungary's golden age was in the fifteenth century when the country became a 'middle power' within the western world. Hungary's borders have waxed and waned over the years; the present boundaries were created after the end of the First World War. Hungary can boast of many famous people, such as the composer Bartok and the actor Bela Lugosi. 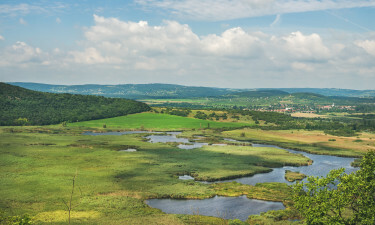 The landscape of Hungary is pleasingly varied with many national parks ideal for camping. The famous Danube river dominates the region, while the Hungarian Plain features unusual grasslands, the Transdanubian area is hilly and forested, while you can explore the most eastern end of the Alps in the west of Hungary and the foothills of the Carpathians to the east. 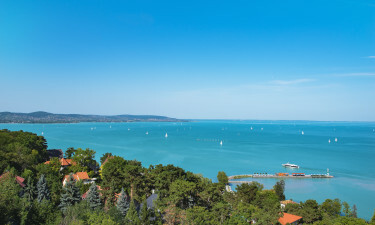 Lake Balaton is the largest freshwater lake in central Europe and is Hungary's most popular camping location with 32 annually inspected campsites in the area. Think of crystal clear lake water, lined with sandy beaches and pine forests; this is the reality of camping at Lake Balaton. There are so many idyllic locations for a luxury camping holiday filled with kayaking, hiking and barbecues. Camping Fured is located near the popular resort town of Balatonfured, along the northern shores of Lake Balaton. It's the main campsite in the area and prides itself on being very luxurious and family-friendly; there are water slides, sandy beaches and plenty of opportunities to eat out. A luxury camping site offers plenty of choice, such as a bungalow tent, a luxury tent, or a mobile home. 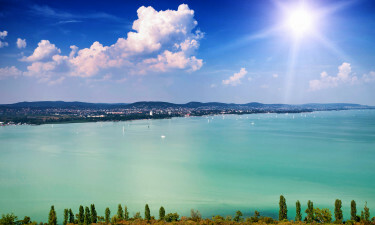 Hungary has many lakeside beaches which are ideal for cooling off in the midday sun. Hungary is also home to some very interesting and unusual species of animal, such as lynx and susliks - a kind of ground squirrel which can be found on the Hungarian steppes. There is no shortage of things to do in Hungary- it is a large and very varied country. Budapest is well worth a visit and is home to some of the country's main attractions, such as exploring Castle Hill or the Parliament buildings. Children and adults will love the Budapest zoo. Outside the capital, another interesting destination is Heviz, a spa town with a large thermal lake. On the southern great Plain, the town of Csillagosveny has a very unusual theme park -a maze theme park, where you can literally lose yourself for hours! Hungarian cuisine is delicious and centred around meat stews and dumplings. 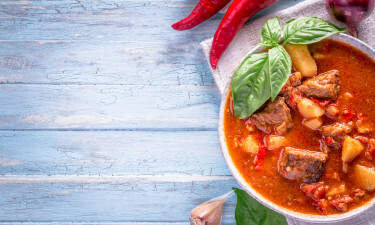 Examples of typically Hungarian dishes include goulash, a meat stew spiced with paprika, chicken paprika- the chicken is cooked in a creamy paprika sauce - and stuffed cabbages.